from Aspire to beyond: Always an interuption somewhere! We had a super last minute job arrise. A next day turnaround that I wasn't expecting. The client is amazing, super nice, and we've worked together lots in the past, so we took the job on. Sadly, it's all hush, hush, so I cant really talk about it. But what I can say, is that it was as much fun as an oversized, 30 foot, PVC chain, barrel full of monkeys! That's it, that's all folks! This meant we didn't get to work to much on the plane cockpits the last couple of days. I still had John drawing up stuff for the other cockpits though! 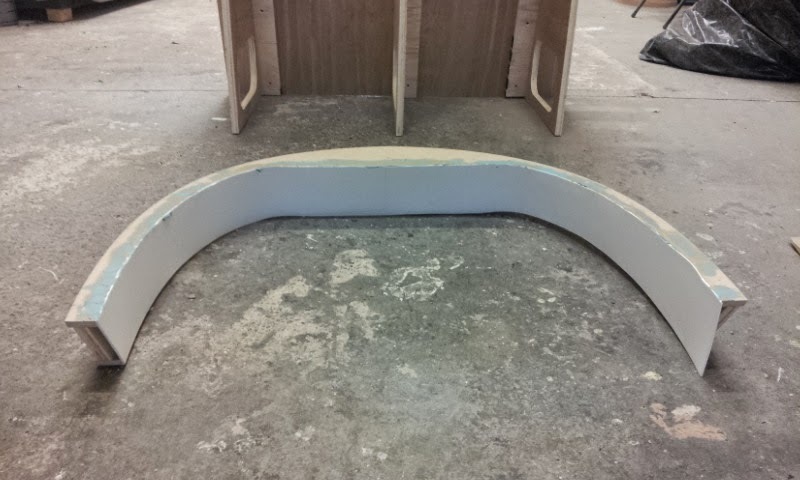 One of the parts I started with today was the curved section at the back of the canopy. 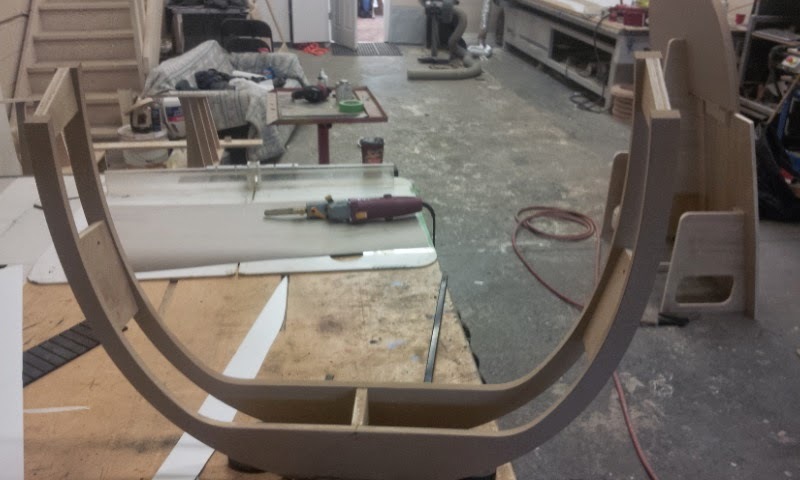 Pretty simple, just 2 offset frames from MDF. Hard to tell in the picture, but both the pieces actually lean backwards at 2 different angles. The plan was to wrap the inside in .060" styrene. I had to make a template first, as I don't have any real 3d geometry to unwrap. This got stapled with upholstery staples, then a clean piece of styrene went over that to hide the unsightly staple work! 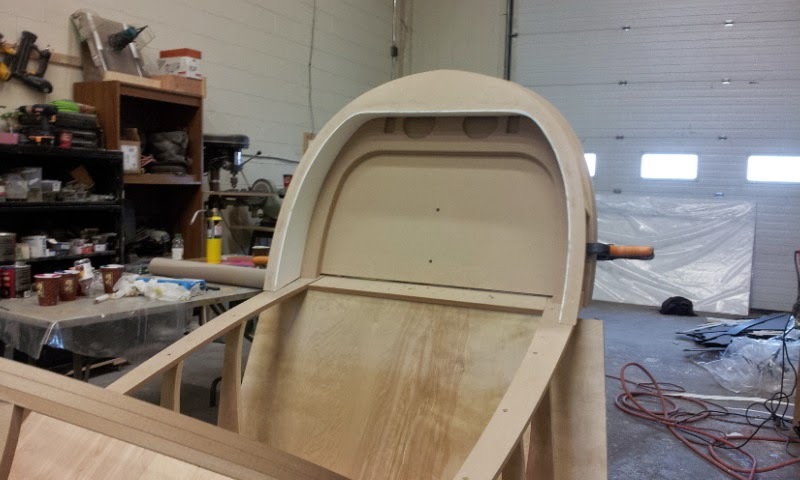 A little bondo on the seams, and it was ready to sand. Once it was in it's final position, it looked great. This is basically the set-up. 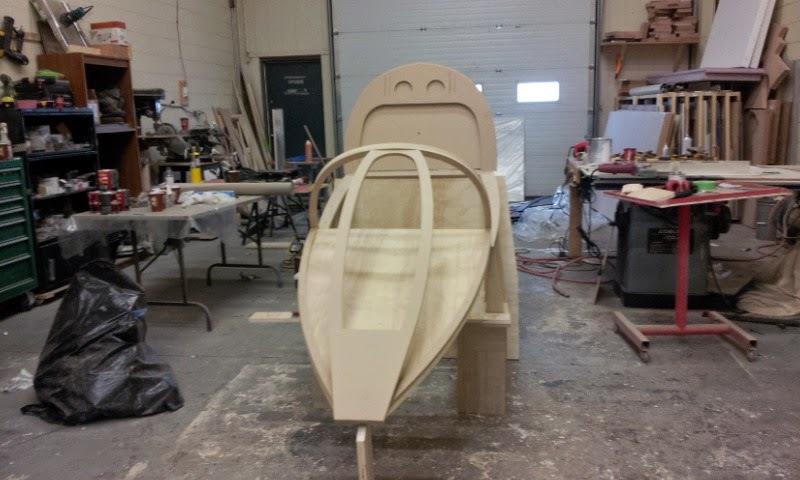 A few minor pieces left on the shell, and it'll pretty much be ready for a little detail work. These won't be SUPER high detail, as the time and budget are pretty tight, but we'll make them look pretty sweet! Water Slides aint a BIG deal!